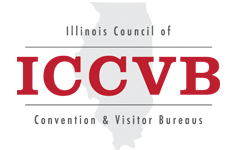 ICCVB maintains several committees that work to promote the organization's mission and to support the industry. Information on our committees and their activities appear below. Due to the nature of its work, this Niche Committee does not provide a plan. Please visit the Meet in Illinois web site at www.meetinillinois.com. Please visit the Sports Illinois web site at www.sportsillinois.com. Please visit the Tour Illinois web site at www.tourillinois.org. Please visit our Advocacy page for advice on advocacy efforts, access to the Illinois General Assembly, and information on the importance of Tourism Funding. For legislation of interest, please visit our legislative partner, Consulting4Biz, Inc.